Help, how to topics > Handy Equipment/Tool Management, general option. Default Database: Select the default database (this is the database that is opened when you start the program). This option is active if you have several inventory databases in the system: Equipment/Tool database, Calibrarion database, Manuals database. View panel width: View panel width defines the width of the left panel (table display). Use Large Font: large fonts are used to display data. Program Lockout Time: if you do not use the program longer than the lockout time you will have to login again. Start Screen: define the starting window, the window that will open after the application starts. Display Page Size: Use this option if you run Handy Equipment/Tool Manager over the network and you have a large number of records. This option defines how many records will be displayed in the corresponding tables. If you have a large number of records setting the page size limit will improve performance of the system. 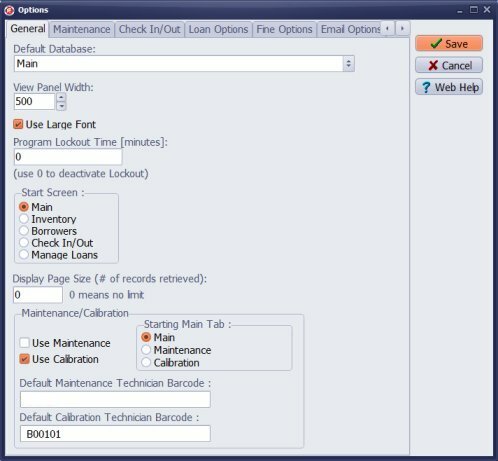 Maintenance/Calibration: activate calibration and/or maintenance features and tables in the program. If you select Use Calibration: a) items in the inventory table will have access to calibration set schedule b) there will be a new Calibration tab in the administrator panel with access to calibration commands and calibration history. Default Database: Select the default database. 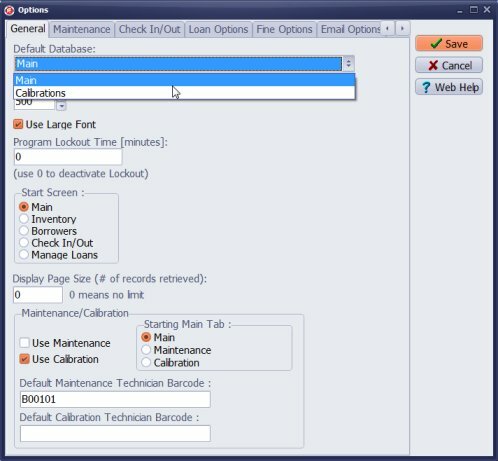 This option is active if you have several databases in the system: Main, Calibration, Manuals.